Dr. Shougyat Abdelmoniem Mohammed Ahmed completed her MBBS, Faculty of Medicine from University of Sana’a, Yemen. Her work experience spans 2 years as house officer in MOH, Khartoum, Sudan followed by a brief stint of 3 years as a medical officer in various centre’s in Sudan like Federal Ministry of Health, Primary HealthCare (PHC), Soba University Hospital. 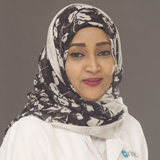 She has also worked as a Clinical attachment in the division of internal Medicine, SKMC, Abu Dhabi and also in Avera hospital USA South Dakota. Her experience as a medical practitioner in the UAE spans 9 months in primary health care, Ras Al-Khaimah and 2 years in MOH, Dubai medical district, Alamal hospital. She has attended numerous Continuous Medical Education programs held in Abu Dhabi and is also certified in BLS. She is a member of the Sudan medical council and the Sudan Physicians Union.